After finally giving up on the forlorn hope that there might be some further growth, I started to dig up the remaining leeks from the last raised veg bed at the weekend. 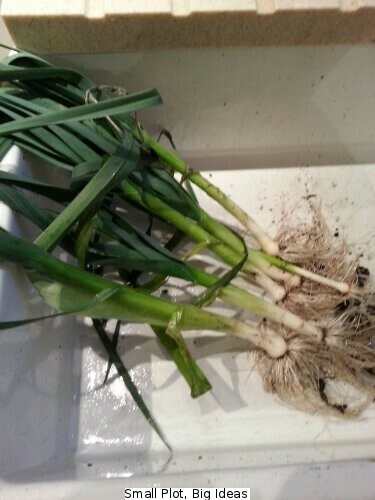 As can be seen below, I brought in about 6 leeks of varying sizes but they were hardly the most impressive haul especially after cleaning them up a bit! However, despite the fact they were not particularly impressive to look at, they were extremely tasty for the evening meal when added to the home-made pasta sauce along with some ham and mushrooms. Perhaps the flavour was enhanced by the amount of time taken to grow them? Overall I think the leeks were worthwhile but given that I grew them seed first planted around the end of February it’s taken quite some time to get anything from them. As I have read elsewhere, in future there needs to be careful planning when allocating space for these because they are in the ground for some time. As I noted in an earlier blog post, even by August they weren’t particularly impressive and some were starting to flower but maybe I was expecting too much especially given the weather this year! My approach this year involved interspersing the leeks with carrots in a single raised bed and this made good use of the space. However I will need to plan the timing for planting out a little better in future to get more out of the space and more organised succession sowing may give better results with the carrots in particular. There are only about 8 small leeks left now and if I’m totally honest most of those bear a closer resemblance to spring onions than leeks but I’ll still make sure I enjoy them once I think of a recipe to use them in! « What happened to November?